The holidays have passed by, swiftly leaving behind the second half of the cold and gloomy winter. For all of those who are not winter’s biggest fan, the countdown to spring begins. The season of April showers will soon be around the corner, washing away the last bits of snow as all of nature wakes up from its deep slumber. The dark snowy skies will soon be replaced by those puffy storm clouds that send shivers down the spine every time they erupt in a rumble of thunder. For the rain lovers this is wonderful news, but for the other folk, this might be even more depressing than the winter months. The commute to work becomes tedious, the trips to the grocery store become a never-ending cycle, and the family outings are non-existent as the kids have to settle for making cookies indoors. But when did the world become such a pessimistic place? I remember when I was a little girl I loved the rainy season. It was the most magical time of the day to hear the slow tapping of the little rain droplets on the roof. I would listen closely as the rhythm of the tiny water drops picked up until the sky erupted into a light show. 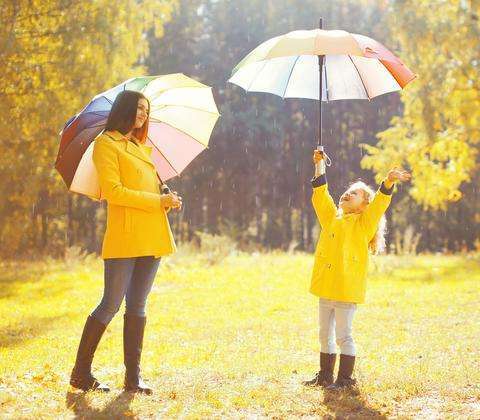 During those days I would beg my parents to take walks with me, to go the grocery store on foot, so I could put on my big rain boots and finally take out my most prized possession out of my closet: my umbrella. It was those little things that used to make me happy and that would brighten up my day. It was that beautiful pop of colour that I got to carry over my head, which made me feel happy on the inside. Getting to indulge in the fresh smell of the rain that the whole world became submerged in is already a good enough reason to get out of the house and take a walk. Those little things in life get lost in the minutia of the everyday routine. The rain is no longer our best friend but an annoying acquaintance who keeps coming back when least expected. Trips to the mall become a scavenger hunt for finding the closest parking spot in order to quickly get out of the car and run to the entrance. When did rain stop us from still going out for lunch during our breaks? 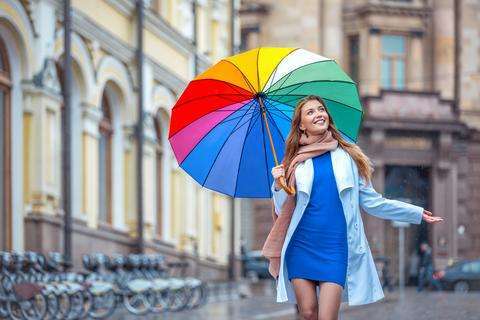 I would trade the stuffy atmosphere of an office for a pair of rain boots and a colourful umbrella any day. It is easy to feel under the weather as the majority of us pull out our dark coloured umbrellas that don’t withstand the rain and ruin our mood, even more, when they break for the hundredth time. Why not invest in practicality and fashion, so that those monotonous days become a distant memory? So the next time it is raining, don’t forget about your inner child that needs to be indulged for the sake of your own mental wellbeing. And what is a good way to indulge children? To give them a one of a kind present. An umbrella that stands out, that has character, which sparks life back into the gloomy, rainy day. La Bella Umbrella offers all of that, it combines pragmatism and style into one. This is the time to get back to the basics. It’s time to take long walks as the pitter-patter of the raindrops play their music on top of vibrant umbrellas. Every gloomy day can be turned into a bright one with a spark of colour and a memory. Here is to making many more of those happy memories and remembering to live in the moment, and never forgetting to indulge that little child inside of every one of us.